The first season of Supergirl was an absolute delight to watch, especially with the family. Melissa Benoist’s portrayal of sweet innocence and charm provided the viewer a creative look at vulnerability contrasted against the impenetrable nature of her character. Loved it. Then came season two. It got really uncomfortable. The character development between Chyler Leigh and Floriana Lima was senseless. To your point Jay, it’s not about homophobia or growing up to accept fringe life styles. It’s about choices, and Hollywood along with others like yourself are going down a road that’s too difficult for many of us to travel. Personally, I like a good Lesbian kiss now and then. I love the show and the actors, this is the only show I let my kid watch. Until he is a little bigger to watch. I enjoy the show Very much! Love it as a matter of fact. I find it to be one which I can enjoy without all the unnecessary violence and overly done sexuality. Of course there is Fighting, but not over done. There is a sexual content, but with taste. It is, actually, a nicely balanced production. Being a fan of Superman since the early sixties I found this to be a refreshing additive. There is actually many plots that could be used to further the future of the show. In the negative year to year and it’s renewed? Optimistic much? It only gets renewed because it pushes leftist agendas. Just love this show. We need more like this one where families can enjoy watching TV together. Bring on the 3rd season! Really like it. Glad its renewed. The worst show ever to air on television. The concept was good, but the politics are so blatant as to make the show unwatchable. It’s a dystopia where strong, powerful men beg favors from stronger, more powerful women. Kind of like the Handmaid’s Tale in reverse. And none of this was necessary – the character was fine without the SJW garbage. No, you leftists are trying to force change on society by destroying it. The rest of us want no part of your sick version of “progress”…. Enjoyed the show from 1st season, however the hidden political messages such as persist and resist are too obvious as being anti trump etc. the show lost the loyal viewer. If I want politically driven content, I can watch CNN or fox. I don’t need it in entertainment too. An Ultra Liberal Agenda show by Hollywood. 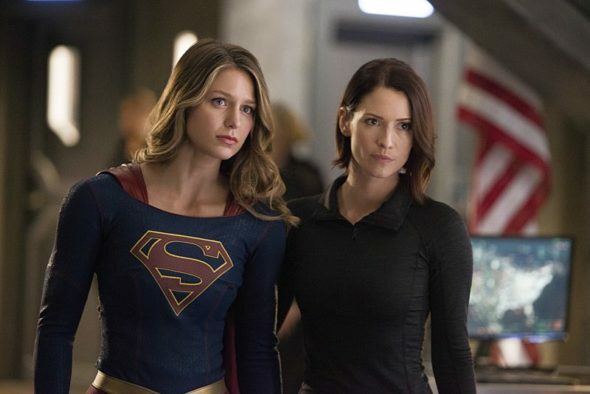 CBS had a much truer version & more fun family friendly show, when it went to CW, episodes were about Alien registration, deportation, a Woman President in a Pants Suit, gun control, lesbian scenes with supergirl’s sister & on and on. The good news is a writers strike could be kryptonite to this series & end it. These comments on their FaceBook page were deleted by the hundreds by the show. C’mon – Lynda Carter speaking in Hillary’s cadences? The character was perfect without the politics. Name me a non-progressive show, anywhere – this one is a little more blatant than usual. Continue 3rd season and beyond.